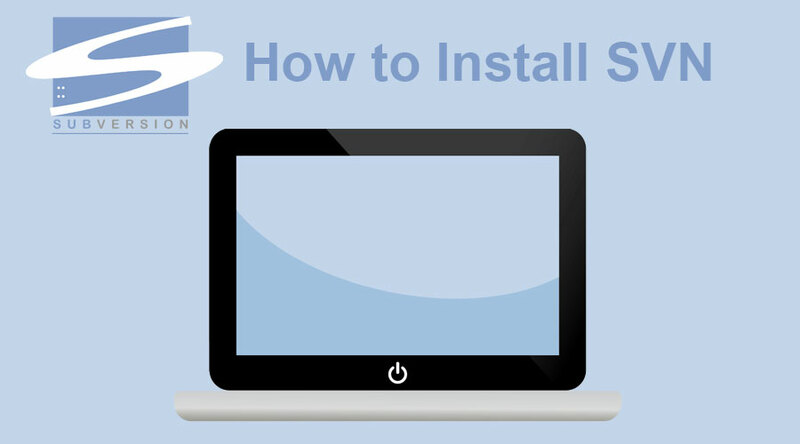 SVN is a valuable tool developed by Apache, used in the world of programming for software versioning and revision. It is an open source centralized system. SVN comes handy when multiple developers are working on an application and they want to maintain their code at a place along with the track of versions created against each file, the commit history of each file. Also, in case your client wants some documents/ progress in your code or else if you are looking to export your code to client locations, probably this is the easiest platform to manage all those things. You can create any number of repositories based upon your content type or other distinguishing criteria specifically. You can create any number of folders in that repository branch and hence clarity prevails too. 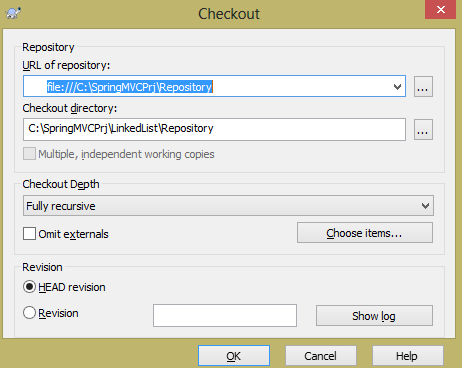 Looking to add code on same file/ service class/repository? Just complete your part of the code and commit/push at SVN. Once you do this, a tracking version will be assigned to the respective files and other developers can update that they have checked out codes from the SVN repository, so your work doesn’t get hampered any longer. Working on different modules and want to merge code later? Well !! 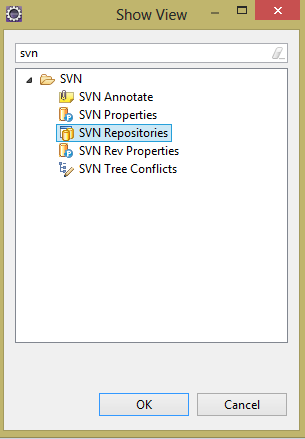 SVN provides branches for that, you can cut a branch from the main branch and place your modules/set of code into it. Branches come handy in cases where you are looking to deliver parts of code in multiple sprints (an agile paradigm). Developers actually take check out from a directory where main development happens and it’s called ‘Trunk’. While working with repositories, remember to take the regular backup, so that if a server fails then you are able to access the recent version of your files. Step 3: Once you mark the folder for repository creation, there appears a dialog box, make sure to copy the URL in blue at your sticky notes for later references. Step 4: Now select your intended project folder which has to be tracked, right click on that and click on SVN checkout option. By doing this, you are telling SVN to keep track of changes we are about to do in our code. So you can see here that the revision number appears to be 0, also you will see that in the checked out folder, a .svn folder will get created. Click on Add option, once you do this; a checkbox for Subclipse would appear ( as named by you while adding the above URL), finish the process. 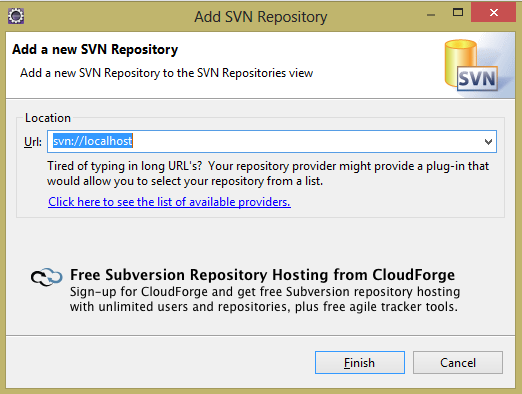 This makes the eclipse get integrated with SVN. “Window” – > “Open Perspective” – > “Other…”, an option of a name will start appearing here now. Right-click, then select New -> Repository Location, then in the URL box type svn://localhost, as shown below, then click on finish. In case you get some error after doing this (i.e. if any error appears at the eclipse console) then make sure to handle the proxy settings ( for references just search the error at stackoverflow.com). Step 9: Now you can keep on editing your program files and eclipse can keep the track of those, to track the changes done, right click on the “Project” in Project Explorer of an eclipse, then go to “Team”, then select “Synchronize with repository”. It will give all the changes appearing there and for the first time, you can simply select the files among the set to be committed and then SVN will generate a revision number against the same. Please make sure to commit the files using this way only, because whenever you commit bulk files/folders then a revision number is generated. In case you are developing a module containing 10 files and they are correlated such that they are planned to be delivered in the same release then make sure to commit all of those in one revision head, so that in case your client tells to revert the changes than simply by reverting that revision number you can feel assured that everything associated was reverted. Step 10: SVN also provides the chance to find the history of a given file, you can directly replace your current code with those revisions also if you desire for the same. Summing up here, the same way SVN can be integrated with IDE like Visual Studio code. So for parallel development, to satisfy agile based work timeline constraints, SVN is good centralization tool.